Please carefully read and understand our Store Policy and Shipping/Handling Fees before placing your order. You can also download this order form (pdf) for mail order. Any questions? 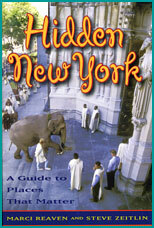 Please contact at store@citylore.org or 800-333-5982 ext 305. 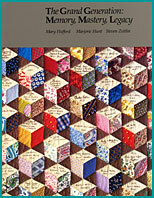 This book encourages the participation of older people in the classroom, engaging young and old in joint ventures to express their personal experiences and family traditions through writing, theater, and the visual arts. Clear, detailed instructions will help you design intergenerational arts projects with students and seniors. 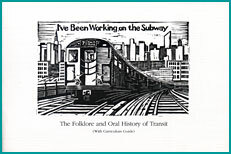 Succinctly told oral histories read as if you’re actually hearing Joe Caracciolo hilariously recount his exploits playing midwife on the C train, or Thomas Granger describe the barriers African Americans faced as they climbed the job ladder. The collection conveys a sense of the people, history, skills, language, dangers, and rewards that define the world of transit workers. 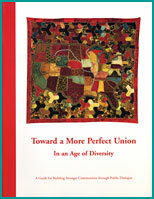 To form a more perfect union we need to talk about the issues that divide us and the ones that bind us. The discussion-starter DVD and guide raise provocative issues and generate thoughtful discussion about difference and diversity, and personal and national identity. Created for community discussion, this resource can be easily applied to school settings. Includes short readings, key documents, bibliography, and filmography. “Why were human beings created?” goes an old Jewish saying. 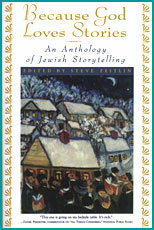 “Because God Loves Stories.” From stories that re-create the lost world of the Eastern European Jewish shtetl to Ladino-infected pieces from Sephardic Jews, from ancient folktales and to contemporary family stories, parables, and humor, this rich volume recounts the Jewish-American experience in stories. This brilliant collection of photographs documents the work of young New York City artists who paint murals on building walls to commemorate young people, mostly Latino and African, who die prematurely, too often violently, on the streets of New York. 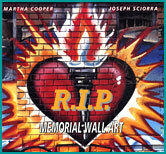 The authors show how the walls transform personal grief into shared public sentiment. The hip, full-color images will draw young people to the lively text which tells a heart-breaking and life-affirming portrait of inner city life. Padma and Deepak, a brother and sister from Calcutta, are the hosts for a journey to contemporary Indian history, culture, geography, and folklore — and serve as a reference work, and special activity guide. 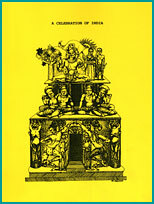 The guide was written for the National Dance Institute’s year-long residency on Indian dance, but is well-suited to more general usage. 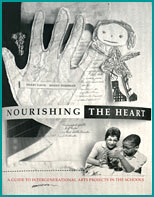 Includes lesson plans, maps, illustrations, resources, and a bibliography. How did those long ago encounters among Native peoples, Europeans, and Africans influence the music and dance we enjoy today? 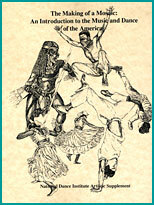 This comprehensive curriculum guide probes the dance traditions of Puerto Rico, Haiti, Trinidad and Tobago, Brazil and Mexico, as well as urban forms, such as tango and hip hop, to reveal how these connections are integral to the formation of cultural identity in the Americas. Includes background information for students and teachers, activities and discussion questions, a glossary, bibliography, and discography. Increasingly, the dying and the bereaved engage in deeply personal — and often shared — creative acts that help them possess their past. 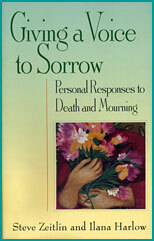 These new traditions for memorializing the dead in stories, adapted and invented rituals, and commemorative art are the subject of this book, “Giving a Voice to Sorrow: Personal Responses to Death and Mourning.” From a 6 year-old girl with leukemia who plans the way she wants to die with her favorite lullaby tape playing, to a 95 year old man who dies on his date of birth, requesting that his senior center continue to celebrate his birthday till he is 100; from a woman who crafted her father’s coffin, to another who designed a quilt incorporating pieces of her father’s favorite shirt, “Giving a Voice to Sorrow” is populated with inspiring and creative individuals who refuse to give death the last word. Two men are traveling through the desert with the closest oasis miles away. One carries a flask filled with enough water to keep one man alive. Who should drink the water? 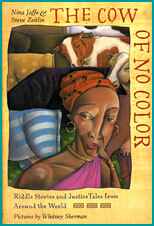 The Cow of No Color is a collection of stories from throughout the world, all of which turn on a question of justice. After the authors describe the problem, they leave it to you to solve, and then tell you the answer as it appears in the original tale. Excellent source notes and bibliography. 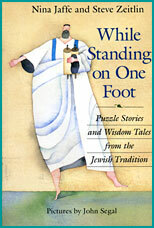 This collection of folktales invites children to match wits with heroes and heroines. At a point in each tale, readers are asked to think about how they might have solved the protagonist’s predicament. The stories tell a history of Jewish life with tales from Biblical times, Eastern Europe, the Lower East Side of New York, and Germany during the Holocaust.